To those completely lost right now: yes, it's another Portal thing. Click here for the game tirade that (kind of) explains it. This is one of my longest delayed tutorials, since I actually made my first grenade nearly three months ago, just after Halloween. The hold-up was finding the proper display, which I had to order, and then re-order, and then get a plaque for, and then re-order another plaque, and now FINALLY I get to share it with you guys! This mod is actually quite simple, and shouldn't cost you more than $10 in materials. (Not including the display case.) 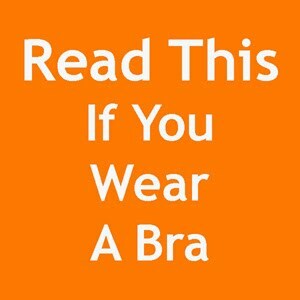 Keep reading to see how! Since Halloween is long over, try looking online or at local costume shops. You want the kind that has a soundboard with the fun "tick-tick-tick-BOOM" feature. Your other key ingredient is the fake lemon. 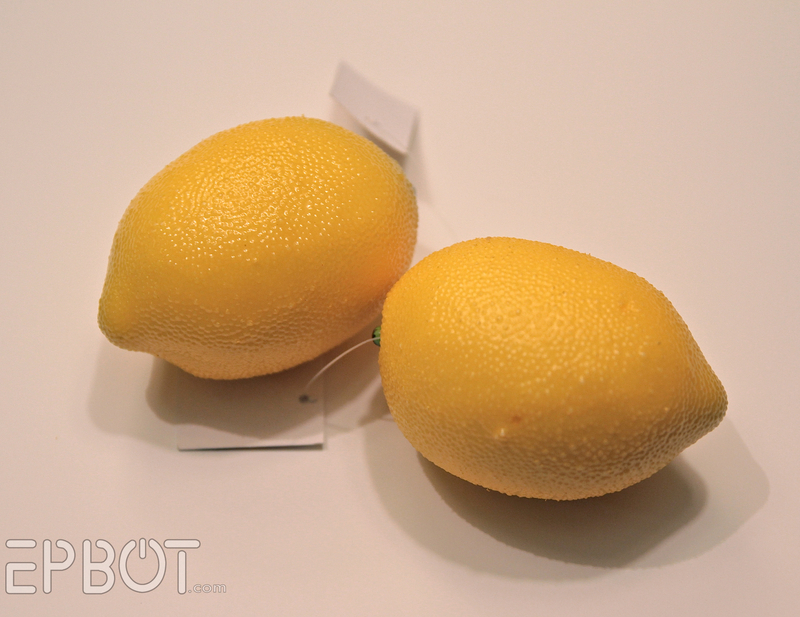 Wal-Mart has the best fake lemons I've ever seen; they're weighted in the middle and textured so realistically I half expected juice to squirt out when I started cutting. I believe these cost $1.99 each. 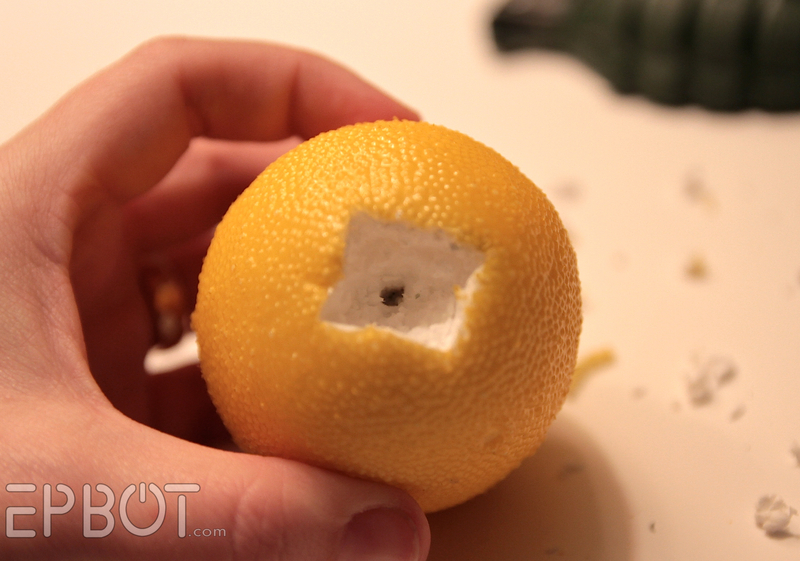 The inside of the lemon is made of Styrofoam, so after you slice through the thick skin you might want to switch to needle-nosed pliers to pull the crumbly foam pieces out, as opposed to trying to slice them your blade. There's a concrete weight in the center of these lemons, so your blade might hit it as you're cutting down. Fortunately I found there was still enough room for the battery box to fit, though. 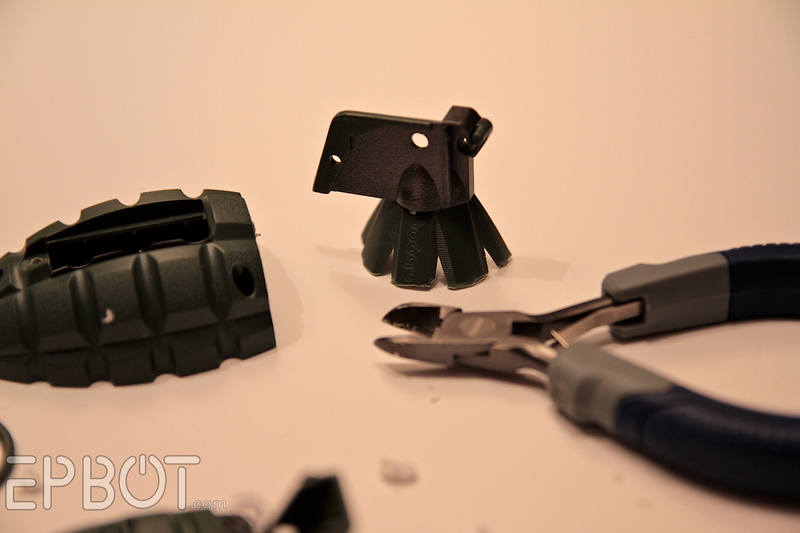 Snip off the top of the grenade with pliers. 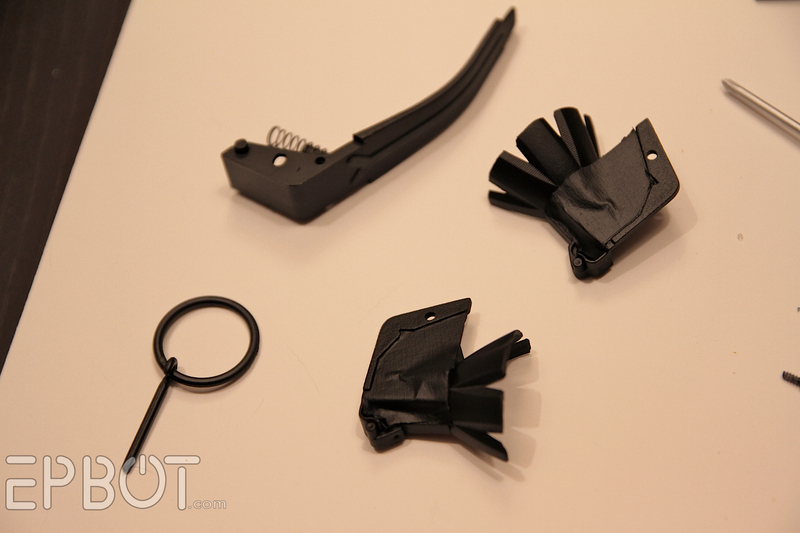 I did one side at a time, and found the plastic was easily bent and snipped. Try to keep those prong bits all the same length, if you can. 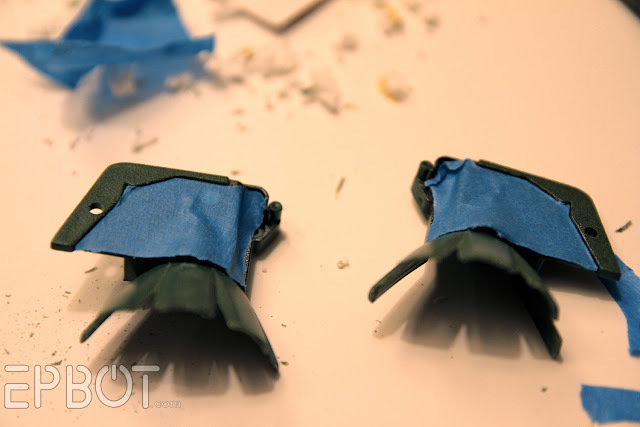 Use a metal file to smooth out the sharp corners and any jagged edges. Now comes the tricky part: putting it all together. 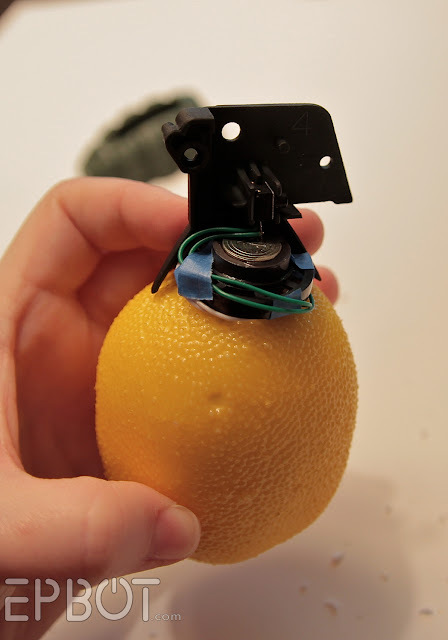 Insert the battery box inside your lemon, and then use a sliver of tape to secure the excess wires to the underside of the grenade speaker. This speaker is going to sit on top of the lemon, directly over your battery box, and it will be held in place by the grenade topper. Here John's drilling the first hole, but I later took over and can assure you: it's not hard. 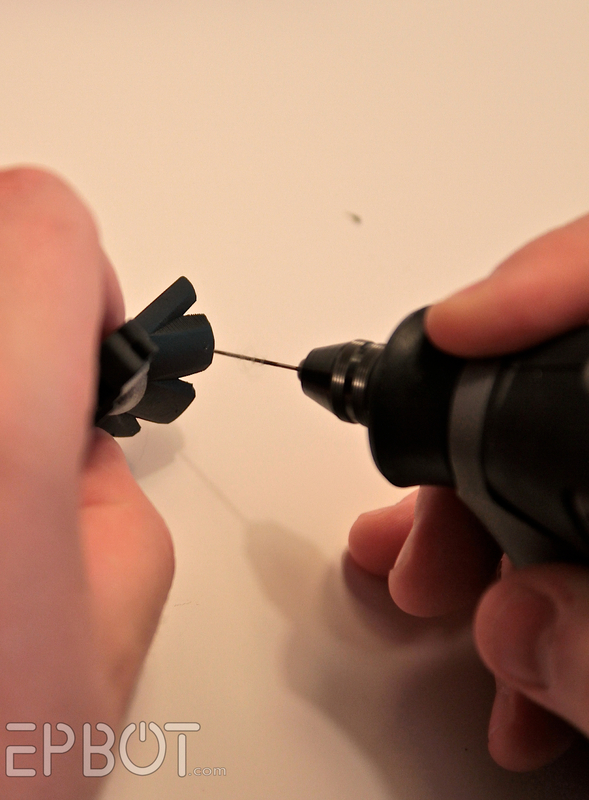 The plastic is easy to punch through, so the only tricky part is making sure you angle your drill bit so the pins will be guided down into the lemon at a roughly 45 degree angle. 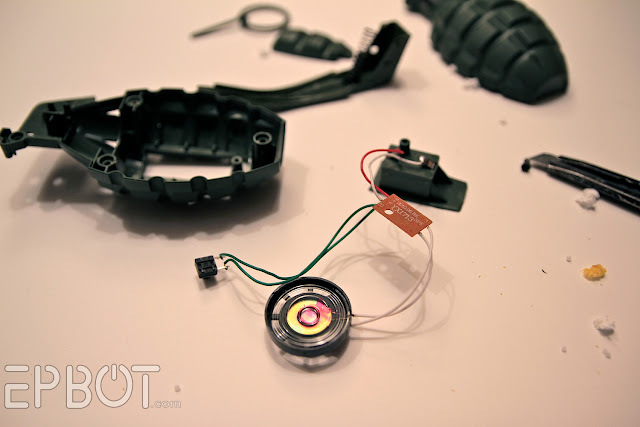 Put your grenade topper together before attaching it to your lemon, though; this picture is only to give you an idea of the fit. You'll also need to re-insert the switch back inside the handle - don't forget, or your lemon grenade won't go boom! 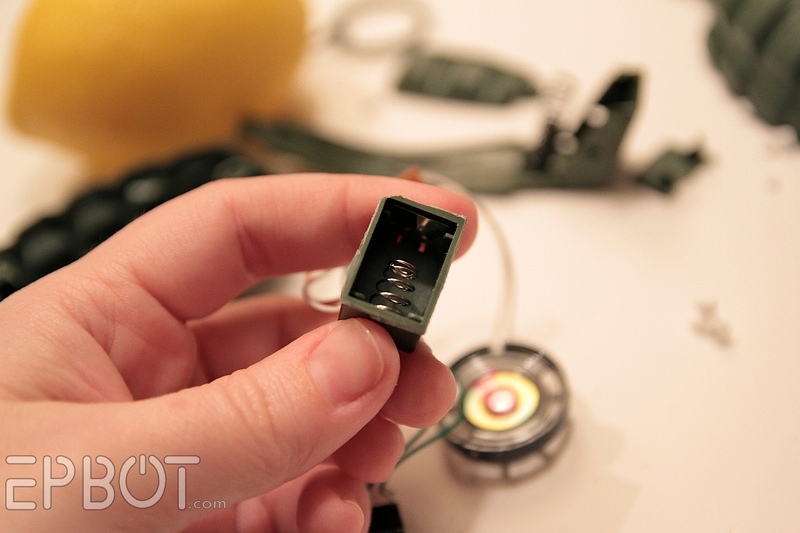 I don't have a process pic for this next step, because it took too many hands for me to spare one for a photo, but it's just a matter of holding the grenade topper in place, wires and speaker nicely tucked underneath, and inserting the pins through the topper's prongs into the lemon. (Get a second person to help you.) 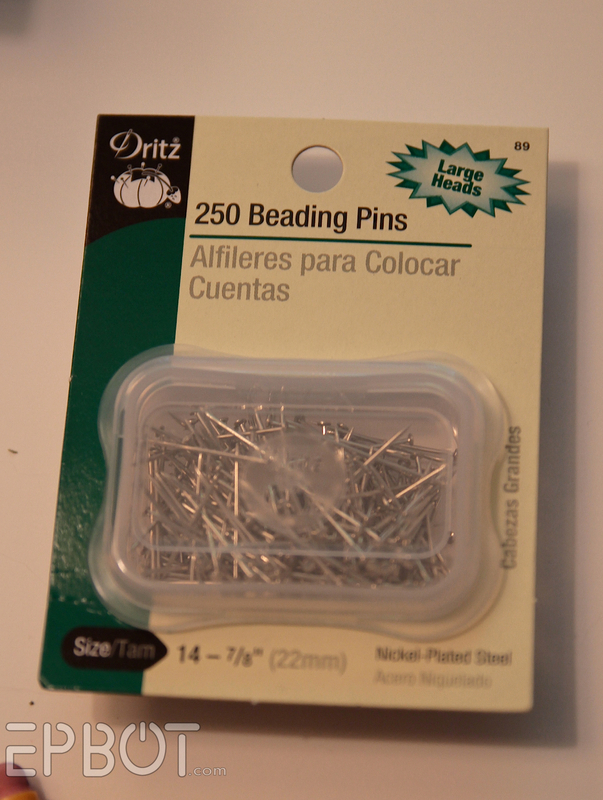 Because the pins will all be inserted at an angle, there's no way the top can be pulled off without removing them. Trust me, I carry my grenade around by the head all the time; it's very secure. Oh, and my pins were a little too long - they kept hitting the concrete center of the lemon - so I had John snip off the ends a bit. You may need to do the same. 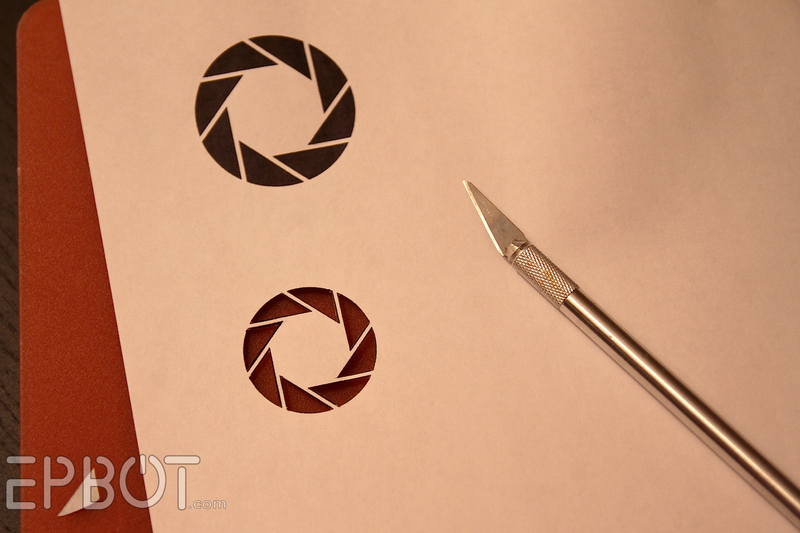 I printed the Aperture logo on plain paper, and then used a craft knife to cut it out for a stencil. 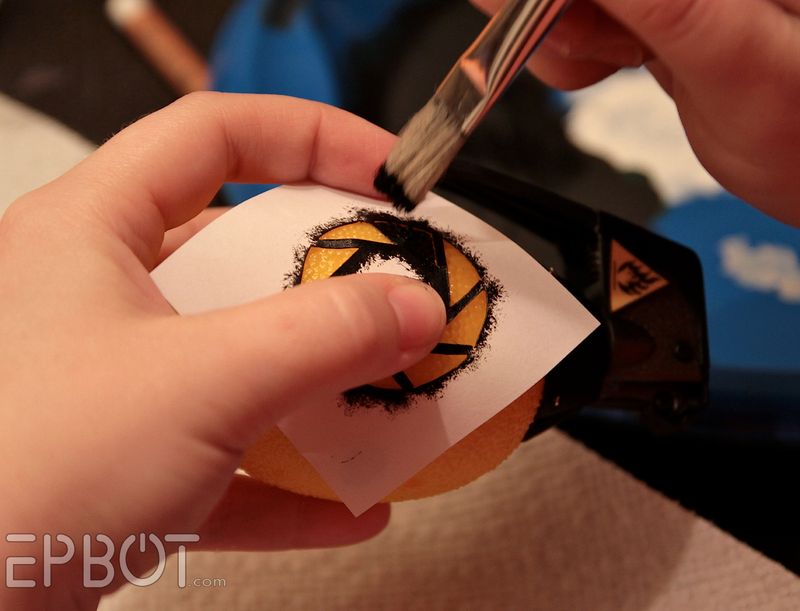 Using a stencil on a bumpy rounded lemon isn't the easiest thing to do, but it WAS easier than I expected. I used an adhesive putty to stick the paper down on 2 sides, and then held each panel down with my fingers as a pounced acrylic paint on with a stiff brush. As with all stencils, be sure to only pounce straight up and down, and watch your fingers: they'll get paint on them, so you don't want that getting smeared on the lemon. Tada! I also found and printed the little yellow Flammable symbol, which I laminated with packing tape and then glued in place on the top. I wasn't happy with the plastic pin that came with the toy grenade, so I replaced it with a stainless steel cotter pin (find them at the hardware store for cheap) and a keychain ring. That's completely optional, though. 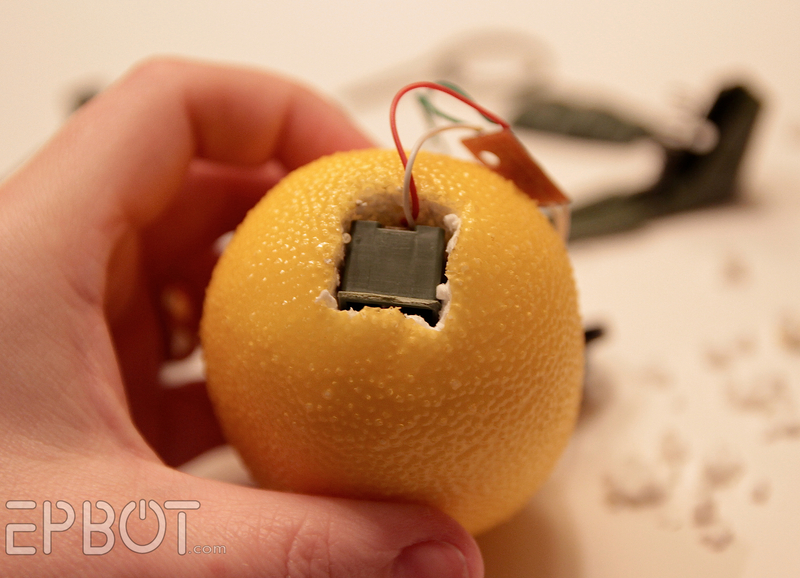 The display is made to hold a softball (I found it on ebay for just under $20 with shipping), and I got the idea from this lemon grenade, which has a soundboard installed in the display base instead of the lemon. That one has the grenade displayed horizontally, though, which I just couldn't get to look right for mine. 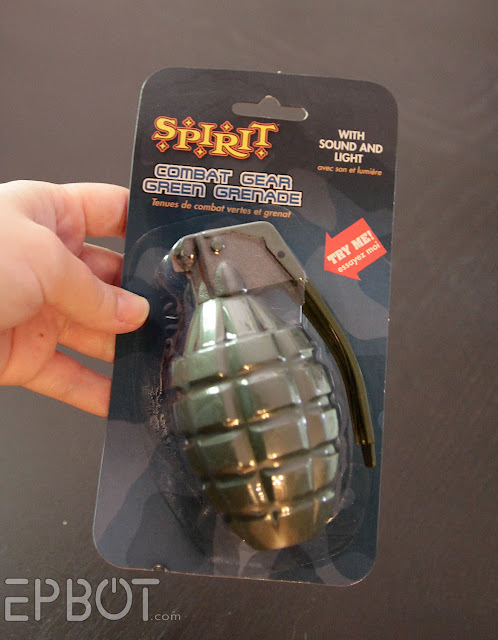 There's a hole in the base, so to fit the plexiglass top on you have to twist the grenade at a slight angle. After weeks of fooling around with trying to modify the base I had a EUREKA moment and realized I could just display the lemon vertically. Problem solved! So that's my lemon grenade! I hope you guys enjoyed the tutorial, because now here's the best part: I made two lemon grenades, just so I could give one away here on the blog! The give-away has ended, and the winner is Elizabeth of The Elizabeth Archive! Congrats, Elizabeth, and please e-mail me your mailing address! Some caveats: you don't get your own display case (those things are expensive! 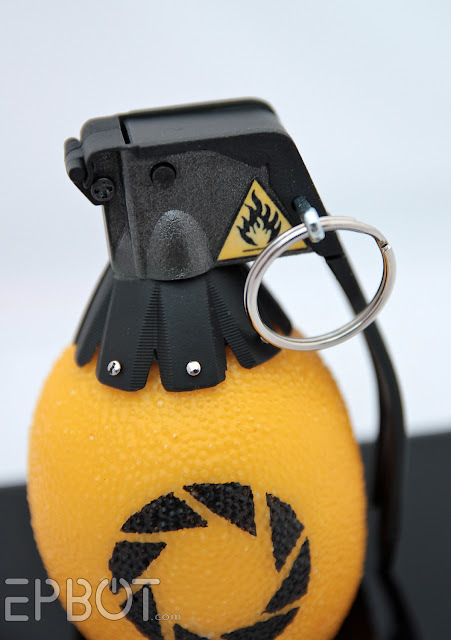 ), and the grenade I'm giving away does have an imperfection, which you can see in this photo: see the slight gap between the topper and the lemon? The battery compartment and speaker were either a little higher, or the lemon is a little bumpier on top, but for whatever reason I just couldn't quite get those prongs to sit flush. You can only see the gap from this angle, though; overhead and from the side looks fine. As always, I'll ship anywhere, so just leave a comment to enter the give-away. I do ask that you only enter for yourself, though - none of this "I have a friend who would love this!" stuff. I'm not trying to be a Scrooge; I just really want this to go to one of you readers. It feels more like a gift to a friend that way, you know? Ok, I think that's everything! I'll choose a winner at random sometime next week, so be watching for that announcement here and on the Epbot Facebook page. I'm a speech teacher, and I would love to have this in my speech room. It would be right up there with angry birds in the list of cool things in my room. ooooh! That would look AWESOME between my mini turrets on my work desk! This is very appealing to me, and unlike the cake, that is no lie. .me. And I am still alive. If I don't win it, I'll make one. Who am I kidding, I'll probably make one anyone with this tutorial. OMG that's so cool! I would love one! This. Is. AWESOME. I immediately starred this so I could make it myself. The further and further I read, the more chances for me to mess it up appeared... I started to feel a little defeated. I would never own my very own :( But then - a giveaway! It's meant to be!! Ack! Want! I mean, umm. . . Want, please? It'd be so neat to have this sitting on a shelf! I think Portal and its sequel are some of the best computer games in a long time. I love this! Portal 1/2 are my favorite games, and I'm always in awe of your creative talent. I would be honored to win your creation. This is AMAZING! 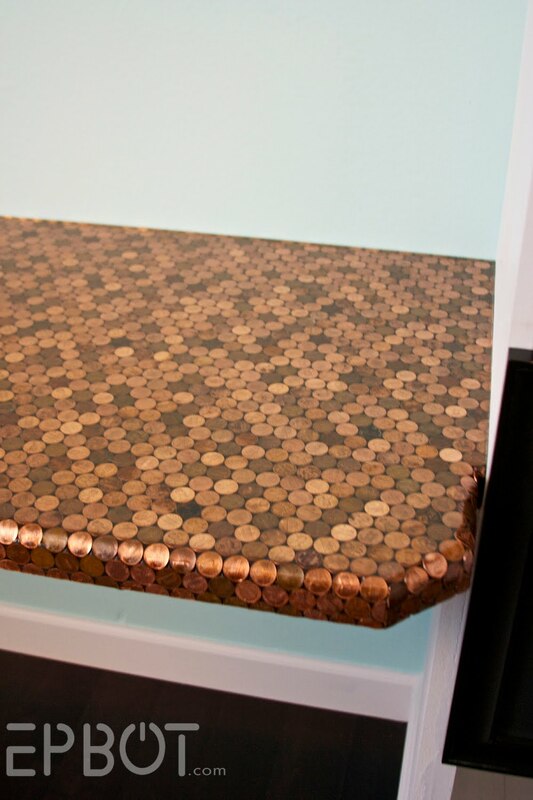 As are all your diys. My girlfriend and I love playing portal and have even gotten her parents into it too! My husband and I are big Portal fans and don't have nearly enough geek art around our house! This is awesome! Love it! I wish i was as creative as you. I'd love to add this to my geek collection. I like yours better than the one you got your idea off of. It's way cute, and I just know I'd never go to that much work....but anyways, so I'm entering. Being as how Portal is one of the few games I've actually played through, how could I not put a comment in? Love it (and you)! GLaDOS: "Maybe you should marry that thing since you love it so much. Do you want to marry it? WELL I WON'T LET YOU! How does that feel?" Please, Jen, let me win/marry it! Don't let GLaDOS win (this one)! I WOULD LOVE IT!!! AHHHHH!!! You're awesome, Jen! This is completely awesome! You are brilliant. I cross-stitched the lemons speech for my husband last Christmas, a lemon grenade would be so perfect to display it with. My now-fiance introduced me to gaming via Portal, and got me Portal 2 for my birthday two years ago! 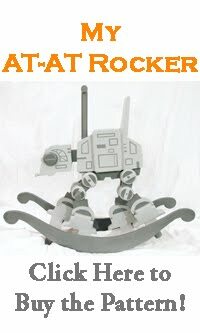 This would look awesome between my plush turret, Weighted Companion Cube, and Curiosity Sphere!! Eee!! This is why I love you, in a purely platonic, love-for-someone-you've-never-met, kind of way. You are ten shades of awesome, and I would love to own anything you've made, this included. 'Cause hey, when life gives you plastic lemons, you make cool grenades.. This is fabulous. Cave Johnson says the most inspirational things. Literally. Look at what he inspired you to do! Totally rad. I just finished playing Portal 2 myself, after watching boys play it before while obnoxiously giving directions. I think it is called back seat gaming. Anyway, I would love this. I love Portal and Portal 2! “When life gives you lemons, don’t make lemonade. Make life take the lemons back! Get mad! I don’t want your damn lemons, what the hell am I supposed to do with these? Demand to see life’s manager! Make life rue the day it thought it could give Cave Johnson lemons! Do you know who I am? I’m the man who’s gonna burn your house down! With the lemons! I’m gonna get my engineers to invent a combustible lemon that burns your house down!" I still can't decide if Cave Johnson handles adversity well or not. My husbands very first cosplay was Cave Johnson; unfortunately somebody this weekend ripped the retractable cord right out of his official Valve lemon. I'd love to win to replace it for him; I'm so proud of him taking his first tentative steps into cosplaying with me! Oh my goodness, that is so nifty!! I was JUST playing Portal 2 a few minutes ago and then decided to check your blog. Also my boyfriend and I beat Portal 2 co-op last week, so this would be a nice trophy of sorts. This would look so amazing next to my Companion Cube and turret gun on top of my son's bookshelf. I love this! 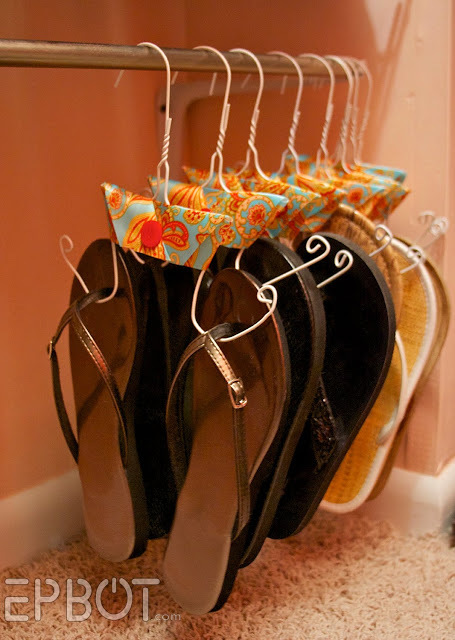 This is awesome.....I wish I had an ounce of the talent you possess for DIY crafts!! I would love this! I only got into Portal after reading on here how awesome it is!! Yes, please!! I love Portal. Q: If everyone who reads this has John snip off the ends of the pins, won't he be terribly busy? So cool! 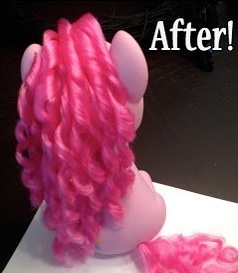 this is something I'm gonna have to try making! 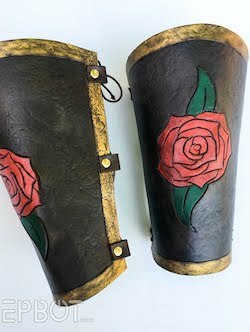 The best thing about giveaways on epbot is that not only are you getting an awesome geeky handcrafted item, you're getting something MADE by JEN! (cue "friends" looking at you like you're mad and asking who this Jen person is). So yeah. Two reasons to possibly treasure this forever. Great tutorial as always! If I don't win it I will probably make one. I would love to display this on my desk. Hello! That song is one of my favorite mean/love(?) tunes! I never saw that number before, but I found it once I looked for it. Oh, and yes, I'm entering the give-away for the lemon, pleaseyplease? Ooooohh!!!!! 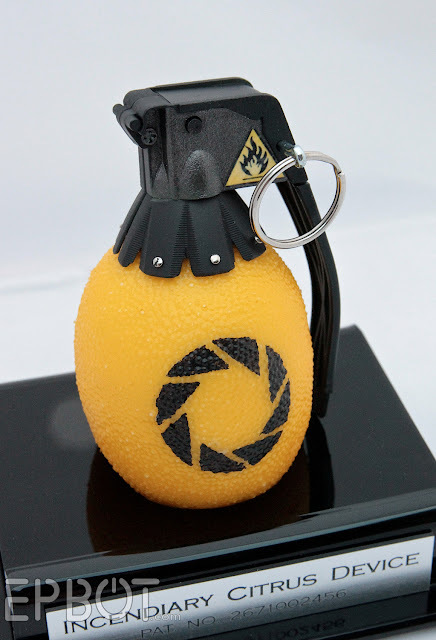 Must.Have.Lemon.Grenade. So putting it in my fruit bowl!!!! Aaah, that's so cool :D Portal is really the game that got me into video games, and it has a mad special place in my heart. I love this! 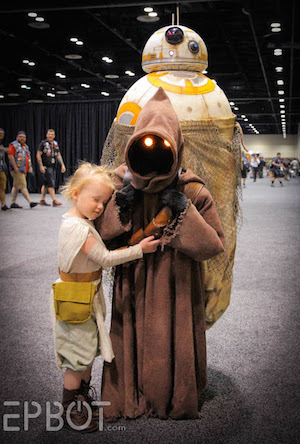 Love Portal, love this so much! DO YOU KNOW WHO I AM??? I'M THE GIRL WHO'S GONNA BURN YOUR HOUSE DOWN! WITH THE LEMONS! This would be the most fantabulous Just-after-birthday-and-not-quite-valentines-day gift ever! Awesome! The Portal series is an absolute favorite of mine. Portal was the 1st game my husband & I completed together (he navigated & we coop puzzle solved on 1 & did 2 player on 2) -- you'd think there would be more after 20 years of marriage, wouldn't you? LOL! So many fond memories! It would indeed look awesome on our mantle (if I win). And yes, the cake is still a lie! If I don't win it, I'm making one! I cannot express just how awesome you are! I'm attempting to have a bit of dignity, but I'm squeeing like a huge fangirl. I would love to be added to the list for a chance to win your grenade! Meeeeeeee! :D Also, awesome mod! Love it!!! I totally want this for myself. If i don't win I will be bugging my bf to get me the supplies for one. Do you know who I am? I'm the man who's gonna burn your house down! With the lemons! I'm gonna get my engineers to invent a combustible lemon that burns your house down!" Another great tutorial! It always amazes me how you come up with this stuff. This would be a totally random item to add to mt collection of tschoksies. Omg! I love it! It would look fabulous on the shelf next to my mini companion cubes, full size companoin cube, and portal bookends. Pick me pick me!!!! 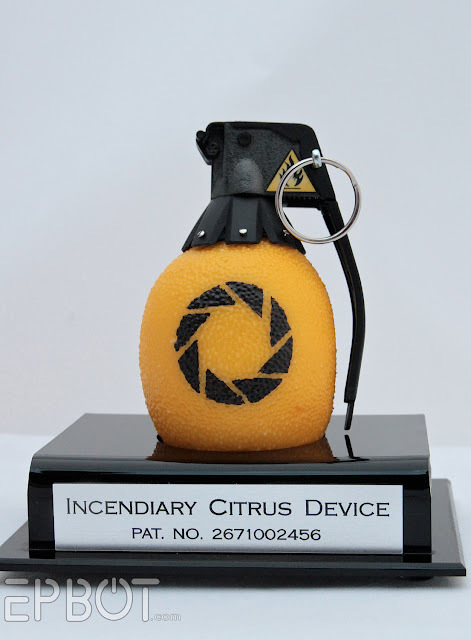 It would be extra funny if I won as I both LOVE portal and HATE citrus fruits, haha. I love the way your mind works Jen! It's beautiful! I love it. This is awesome! I would love to win one! For ScienCe!!! This would go perfectly with the exact replica portal gun we already own. Yesh! Want! this is so cool!! I have so got to make me one of those. Oh oh OH!!! Pick me pick me!!! This is too much awesome to resist. And it could sit on top of my hand-painted portal mug, next to my companion cube and tiny little turret! Oh, so very nifty! I want ti! Oh please, oh please, oh please may I win this! I'll even bow down to the potato! The fruit bowl is an awesome display idea! Um, yes please! I would love this and it would probably also be the only thing of mine that the other half would actually let me display when company visits. PLUS. . . I could totally use it in an Edgar Portal-themed photo shoot, which, I'm still trying to figure out how to turn him into a companion cube. That is FANTASTIC. I'd love to make myself one, although knowing me, I'll probably never get around to it. We'll see. This is a great tutorial. I would LOVE one of these! I started playing Portal at your recommendation, so this would be amazing! That would look awesome on my desk. Thank you for introducing me to portal. It is now my favorite game! 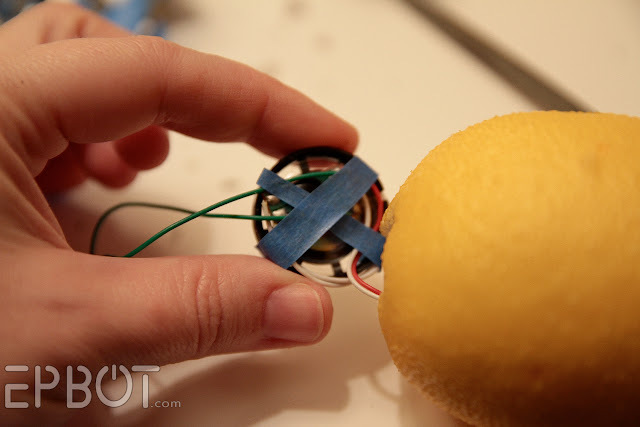 A lemon that goes BOOM? That is SO fricking cool! That is so awesome! I'm working on a geeky game room so this would work great! and I will probably end up making a few of these too! I have a couple brothers who are also big fans. This is really cool! I want it!! That tirade is the best part of Portal 2! Very Cool! my 5 yo son wants to make one RIGHT NOW! This is glorious! Can't wait to try it out! Awesome! I would LOVE to win! It would go perfectly with my mini-Portal gun & jumpsuit display! Me want for Fruit Bowl! Like many here, if I don't win it I'm going to try making one. LOVE THIS! I work in a restaurant in the kitchen, and I actually made my coworkers listen to the Portal 2 soundtrack today. Good times. Portal is the first game my fiance ever taught me to love, and I'd be over the moon if I got this. Your tutorials are amazing. This would be so awesome on the computer desk (although me and my hubby will probally chase each other around with it) Don't make me get the combustible lemon! Portal was/is one of my all-time favorite games (I don't like just killing people randomly, I like games with a point or a quest of some sort c:) and to have a grenade lemon would be fabulous! OMG this is so cool! My husband pre-ordered the Orange Box way back when so we have a long history with Portal. One of these would be a nice addition to our little valve collection. (MEDIC!) Or I might let him take to work and it can go next to his bag of Cheezy Poofs and Mr. Bump. I'm sure the other docs would think it's totally normal to have a lemon grenade in you office. 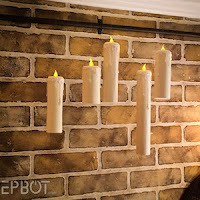 This would look so amazing in the house right next to our talking Cave Johnson painted portrait lol:)!! great project!! OMG love it! I got Portal 2 for Christmas and am probably about half way through (though I dunno, I'm just guessing) but I know the lemon quote! This would look perfect next to my space core and companion cube! I think you are the most fantastically cool person I wish I knew in person! This is completely awesome! Oh, this would be the greatest desk decorator-majigger ever! Can I haz lemon grenade? "Do you know who I am!" To repeat the comment I left on you FB page, "This is the awesomest thing I've seen on the interweb in in quite sometime." This would look great on my bookshelf next to my Portal bookends. Give it to me . . . because . . . you can . . . Awesome!!! I want this! We love Portal/Portal 2. Made my son a Portal 2 cake for his 18th! Yay lemon grenades! 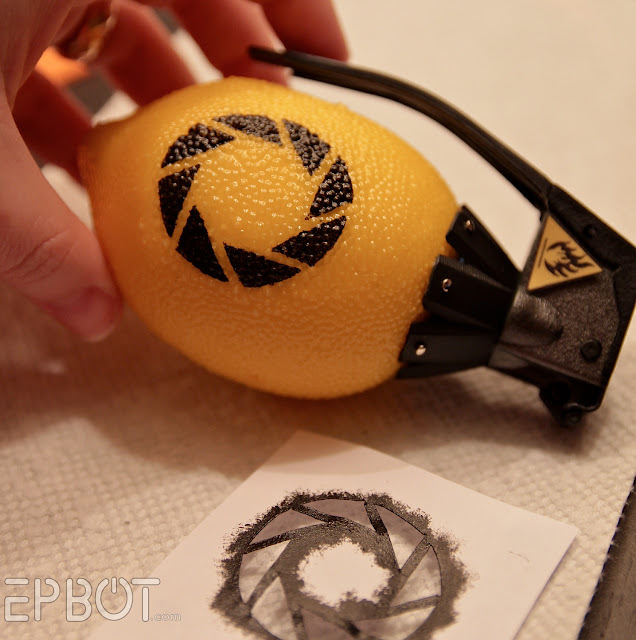 I'm still trying to finish Portal 1 but I've watched my friends play enough Portal 2 that I would love a lemon grenade... hopefully it would motivate me to finish the game! Love this! Consider me entered! Thanks for thinking of us Jen! Commenting is alway's such a pleasure! @Ruth Laird... I'm the clever one, you're the potato one. Fantastic! If I don't win it, I'll definitely DIMyself! Oooh, maybe age it with your aging tutorial... and add a little rust to the handle... Dare I say, glue a few gears on it?! Steampunk Lemon Grenade!!! You are so bad for my wallet, madame! I would love to win this! Eeeee! I'd love to get one of these. I'd put it on my geek shelf with my 11 Doctors, plushie Falcon, and Enterprise! This thing is pretty cool. I never would have thought of doing that. That is soooo cool! :D Thanks for entering me in your giveaway. That is awesome! I'd totally love to win it, but if I don't, I'll have to see if I can make my own. Even if I don't win, I've won because you showed the how to. I'm going to make a bunch and use them in one of those tall glass vases that people love to put fake fruit in. Take that Pottery Barn! Is it bad that I've probably wanted this more than all the other cool stuff you've given away on this blog? *blush* That's saying something right there. Awesome Jen! You did a great job! Oh.mah.gosh. I love it!! How awesome would that be?! 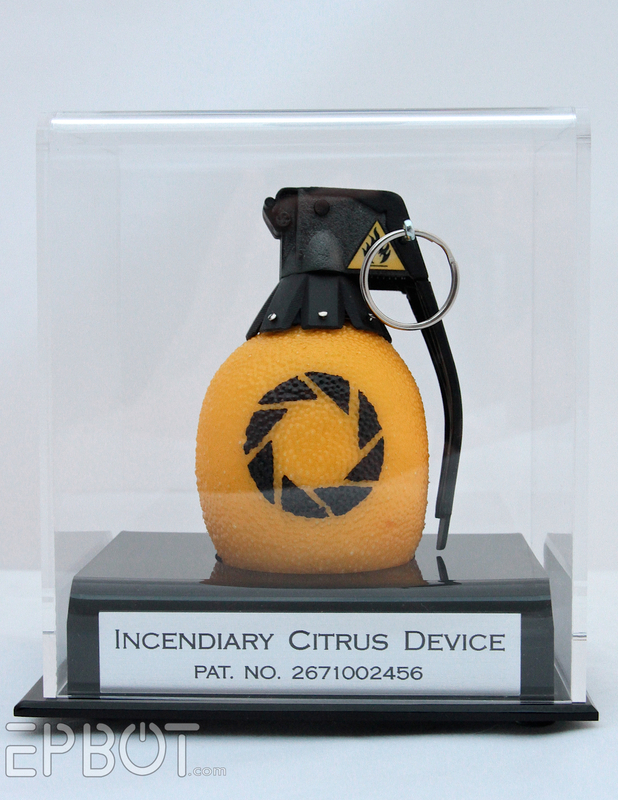 I did the cross stitch lemon grenade for the hubs, but this would be an awesome way to show him I <3 Portal more! Love it! Great job as always! Squee!! I have the perfect geeky corner for this in my living room! I really, really want a combustible lemon. Mokiki does the sloppy swish for lemon grenade!! I've been a fan of lemons and awesome mods for years! I would love to put this with the other lemons I have. We are a Portal playing household. This would look awesome displayed in the living room! I must register my complete and utter objections to the state of my personal happiness for which I find you completely responsible for, as of now. Well,ok Now. I had previously been able to avoid the time supension/reality twisting/fun objectification sort of thing you ascribe in your "web-log", however you now make it absolutely unavoidable to confine my explorations of digitally drawn worlds and mysterious adventures to the small screen I conceal in my handbag. Oh you wicked wicked gaming succubus, you! I was lured into the Portal Universe by the dulcet tones of the unseen voice in the videographic display! I hope you know I am so old I remember waiting those precious minutes as the operating system loaded... click click zzzzrrrkkcc pop!, then the diskette was delicately inserted...faint music would play and the fantastic gray image in the tiny box awaiting my command... "walk north". I had reclaimed my life, now I am doomed.... sob. I have been working on the lemon quote cross stitch for months, I am not a very good crafter. Right now I have some portal quotes on the fridge, and this lemon would look great in our house, maybe next to my XFiles Barbies. I don't want your damn lemons! What am I supposed to do with these?! I'd absolutely love this! 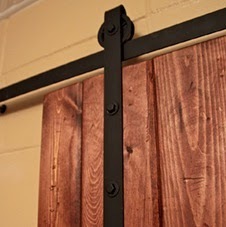 I sort of wish I was handy enough to make one myself! Oh! I would LOVE that! OMG! You are amazeballs! I'd love this for Valentine's day! That is incredibly awesome!! Consider this my entry for one. I need this to go along with the cross stitch i am starting from etsy! this is a pretty awesome rant! So AWESOME! Cave would be proud :-) I would love to get one! This would be the perfect thing to put on my bookshelf next to my portal mirror!! Exellent work!! I'd be honored to win this. 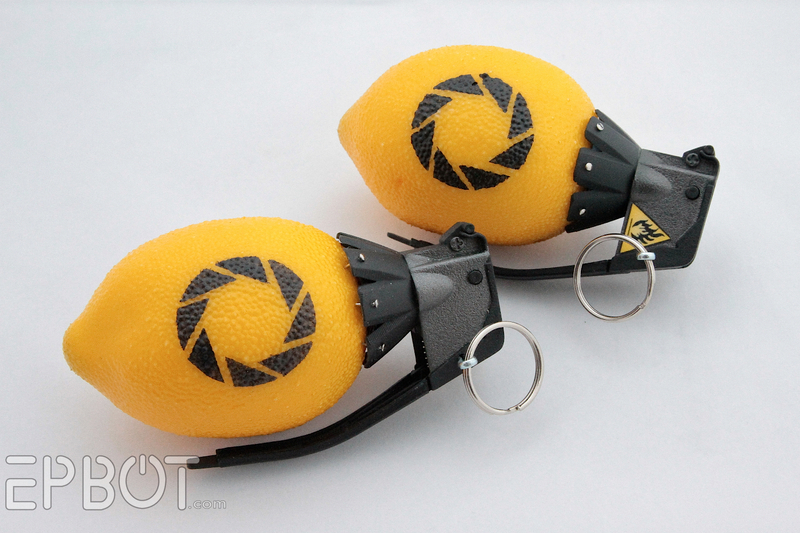 I'd LOVE a lemon grenade! :) I'm a huge Portal fan! :) Thanks for such a great giveaway!! You make the coolest stuff! I would totally love this and display it next to my Tomb Raider doll, my pirate chest and mermaid statue. I sure could've used that last Halloween. I went as Portal 2 Chell and I had no combustible lemons. Oh gosh, that's so awesome! Want! "If you love safe science so much, why don't you marry it!" Yes, I would love life to randomly to give me this lemon! This is the most brilliant use of fake fruit I've ever seen. I love anything Portal and would love to be able to display something as awesome as this in the middle of my geek-filled living room. 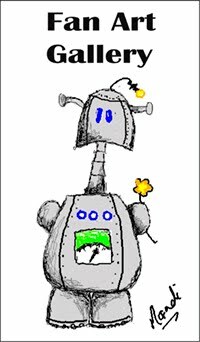 As a long-time reader of Epbot it would be so special to have something you made. I hope I'm the lucky winner! This is so cool! I'm going to have to make some for myself, I think, haven them scattered sporadically all over the house to confuse guests... Ahaha. Ah! I would love this and it would make my husband SO SO jealous! I love your tutorials. Thanks for sharing! Now that's glorious. Life will rue the day Jen thought to give her readers lemons! That is so awesome! I love your tutorials. judging by the number of entries as of posting, i know i stand no chance of getting this. . .
but still, I WANTS IT!! that lemon rant is one of my favourite things in the history of ever. i will probably at some point make myself the cross stitch wall hanging of it. . .
Haha cute! I love it! I want to cross stitch the whole lemon rant into a sampler, this would go perfect with it!! Oh Jenn you most glorious of crafters. Such creative prowess you have. I would be honored and flattered, and forever in your debt if I were to win this priceless crafted goodness. I would love to display this in my new apartment. :-) Love your tutorials, Jen! That is *awesome*. If I don't win it, I think I'll try to make one! I LOVE your grenade. I'd kill for one of those. This is awesome!! If I'm not lucky enought to win one I just might make my own since your tutes are awesome. <3 This is too awesome. Lemon? I love lemon! Exploding lemon?! Even better. Yes, please! This is the first time I've ever commented, but because I want this so badly it's worth it! I love your blog(s) so much! Just yesterday I was proud to be the (unfortunately only) girl to lead my lab group in a rousing chorus of "Still Alive," and I largely have you to thank! The second I saw this I though "with all the lemons I've been handed recently, I need one of these!" When I read through to the end I saw I could get one and I squeed. Loudly. And scared the dog. Oops. My daughter is a huge fan of Portal, but she doesn't read your blog (despite my attempts, or perhaps because of my attempts. I can't get her to read books that I recommend either). And her birthday was last Thursday. Oooooooh! So nifty! If I don't win one, I may have to make one! That would be cool to have!